Original Commodore logo: all-lowercase company name (1962–1984). The company that would become Commodore Business Machines, Inc. was founded in 1954 in Toronto as the Commodore Portable Typewriter Company by Polish immigrant and Auschwitz survivor Jack Tramiel. For a few years he had been living in New York, driving a taxicab and running a small business repairing typewriters, when he managed to sign a deal with a Czechoslovakian company to manufacture their designs in Canada. He moved to Toronto to start production. By the late 1950s a wave of Japanese machines forced most North American typewriter companies to cease business, but Tramiel instead turned to adding machines. 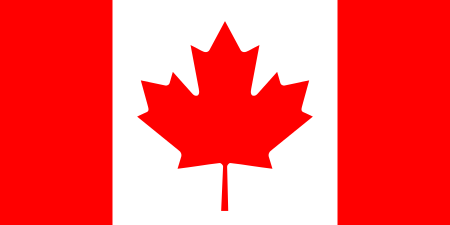 In 1955, the company was formally incorporated as Commodore Business Machines, Inc. (CBM) in Canada. In 1962, Commodore went public on the New York Stock Exchange (NYSE) under the name of Commodore International Limited. In the late 1960s history repeated itself when Japanese firms started producing and exporting adding machines. The company's main investor and chairman, Irving Gould, suggested that Tramiel travel to Japan to understand how to compete. Instead, he returned with the new idea to produce electronic calculators, which were just coming on the market. Commodore soon had a profitable calculator line and was one of the more popular brands in the early 1970s, producing both consumer as well as scientific/programmable calculators. However, in 1975, Texas Instruments, the main supplier of calculator parts, entered the market directly and put out a line of machines priced at less than Commodore's cost for the parts. Commodore obtained an infusion of cash from Gould, which Tramiel used beginning in 1976 to purchase several second-source chip suppliers, including MOS Technology, Inc., in order to assure his supply. He agreed to buy MOS, which was having troubles of its own, only on the condition that its chip designer Chuck Peddle join Commodore directly as head of engineering. Through the 1970s, Commodore also produced numerous peripherals and consumer electronic products such as the Chessmate, a chess computer based around a MOS 6504 chip, released in 1978. In December 2007 when Tramiel was visiting the Computer History Museum in Mountain View, California, for the 25th anniversary of the Commodore 64, he was asked why he called his company Commodore. He said: "I wanted to call my company General, but there's so many Generals in the U.S.: General Electric, General Motors. Then I went to Admiral, but that was taken. So I wind up in Berlin, Germany, with my wife, and we were in a cab, and the cab made a short stop, and in front of us was an Opel Commodore." Tramiel gave this account in many interviews, but Opel's Commodore didn't debut until 1967, years after the company had been named. "Computers for the masses, not the classes"
Once Chuck Peddle had taken over engineering at Commodore, he convinced Jack Tramiel that calculators were already a dead end and that they should turn their attention to home computers. Peddle packaged his single-board computer design in a metal case, initially with a keyboard using calculator keys, later with a full-travel QWERTY keyboard, monochrome monitor, and tape recorder for program and data storage, to produce the Commodore PET (Personal Electronic Transactor). From PET's 1977 debut, Commodore would be a computer company. Commodore had been reorganized the year before into Commodore International, Ltd., moving its financial headquarters to the Bahamas and its operational headquarters to West Chester, Pennsylvania, near to the MOS Technology site. The operational headquarters, where research and development of new products occurred, retained the name Commodore Business Machines, Inc.
By 1980 Commodore was one of the three largest microcomputer companies, and the largest in the Common Market. BYTE stated of the business computer market, however, that "the lack of a marketing strategy by Commodore, as well as its past nonchalant attitude toward the encouragement and development of good software, has hurt its credibility, especially in comparison to the other systems on the market". The PET computer line was used primarily in schools, where its tough all-metal construction and ability to share printers and disk drives on a simple Local Area Network were advantages, but PETs did not compete well in the home setting where graphics and sound were important. This was addressed with the introduction of the VIC-20 in 1981, which was introduced at a cost of US$299 and sold in retail stores. Commodore took out aggressive ads featuring William Shatner asking consumers "Why buy just a video game?" The strategy worked and the VIC-20 became the first computer to ship more than one million units. A total of 2.5 million units were sold over the machine's lifetime and helped Commodore's sales to Canadian schools. In another promotion aimed at schools (and as a way of getting rid of old unsold inventory) some PET models labeled "Teacher's PET" were given away as part of a "buy 2 get 1 free" promotion. Australian adverts in the mid-1980s used a tune speaking the words "Are you keeping up with the Commodore? Because the Commodore is keeping up with you." In 1983, Tramiel decided to focus on market share and cut the price of the VIC-20 and C64 dramatically, starting what would be called the "home computer war". 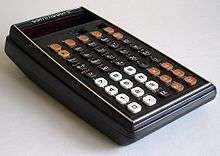 TI responded by cutting prices on its TI-99/4A, which had been introduced in 1981. Soon there was an all-out price war involving Commodore, TI, Atari, and practically every vendor other than Apple Computer. Commodore began selling the VIC-20 and C64 through mass-market retailers such as K-Mart, in addition to traditional computer stores. By the end of this conflict, Commodore had shipped somewhere around 22 million C64s—making the C64 the best selling computer of all time. At the June 1983 Consumer Electronics Show Commodore lowered the retail price of the 64 to $300, and stores sold it for as little as $199. At one point the company was selling as many computers as the rest of the industry combined. Its prices for the VIC-20 and 64 were $50 lower than Atari's prices for the 600XL and 800XL. Commodore's strategy was to, according to a spokesman, devote 50% of its efforts to the under-$500 market, 30% on the $500–1000 market, and 20% on the over-$1000 market. Its vertical integration and Tramiel's focus on cost control helped Commodore do well during the price war, with $1 billion in 1983 sales. By early 1984 Synapse Software—the largest provider of third-party Atari 8-bit software—received 65% of sales from the Commodore market, and Commodore sold almost three times as many computers as Atari that year. Despite its focus on the lower end of the market, Commodore's computers were also sold in upmarket department stores such as Harrod's. The company also attracted several high-profile customers. In 1984, the company's British branch became the first manufacturer to receive a royal warrant for computer business systems. NASA's Kennedy Space Center was another noted customer, with over 60 Commodore systems processing documentation, tracking equipment and employees, costing jobs, and ensuring the safety of hazardous waste. Second Commodore logo, with mixed-case company name (1985–1994). Although by early 1984 Creative Computing compared Commodore to "a well-armed battleship [which] rules the micro waves" and threatened to destroy rivals like Atari and Coleco, Commodore's board of directors were as impacted as anyone else by the price spiral and decided they wanted out. An internal power struggle resulted; in January 1984, Tramiel resigned due to intense disagreement with the chairman of the board, Irving Gould. Gould replaced Tramiel with Marshall F. Smith, a steel executive who had no experience with computers or consumer marketing. Tramiel founded a new company, Tramel Technology (spelled differently so people would pronounce it correctly), and hired away a number of Commodore engineers to begin work on a next-generation computer design. Now it was left to the remaining Commodore management to salvage the company's fortunes and plan for the future. It did so by buying a small startup company called Amiga Corporation in February 1983, for $25 million ($12.8 million in cash and 550,000 in common shares) which became a subsidiary of Commodore, called Commodore-Amiga, Inc. Commodore brought this new 32-bit computer design (initially codenamed "Lorraine", from 1979, and had been called High-Toro from 1980 -1981 then later dubbed the Amiga, under Amiga Inc.in early 1982. There were three unsuccessful attempts to release the Amiga by Jay Miner and company. These were: 1982, 1983 and one more after Commodore bought Amiga in 1984, after which it was released only to the local public. Then in 1985 Commodore re-released it to the world. Cost was $1000-$1300. But Tramiel had beaten Commodore to the punch. His design was 95% completed by June (which fueled speculation that his engineers had taken technology with them from Commodore). In July 1984 he bought the consumer side of Atari Inc. from Warner Communications which allowed him to strike back and release the Atari ST earlier in 1985 for about $800. The Atari ST was technology was almost out, however the Amiga was out sooner. During development in 1981, Amiga had exhausted venture capital and was desperate for more financing. Jay Miner and company had approached former employer Atari, and the Warner-owned Atari had paid Amiga to continue development work. In return Atari was to get one-year exclusive use of the design as a video game console. After one year Atari would have the right to add a keyboard and market the complete Amiga computer. The Atari Museum has acquired the Atari-Amiga contract and Atari engineering logs revealing that the Atari Amiga was originally designated as the 1850XLD. As Atari was heavily involved with Disney at the time, it was later code-named "Mickey", and the 256K memory expansion board was codenamed "Minnie". The following year, Tramiel discovered that Warner Communications wanted to sell Atari, which was rumored to be losing about $10,000 a day. Interested in Atari's overseas manufacturing and worldwide distribution network for his new computer, he approached Atari and entered negotiations. After several on-again/off-again talks with Atari in May and June 1984, Tramiel had secured his funding and bought Atari's Consumer Division (which included the console and home computer departments) in July. As more execs and researchers left Commodore after the announcement to join up with Tramiel's new company Atari Corp., Commodore followed by filing lawsuits against four former engineers for theft of trade secrets in late July. This was intended, in effect, to bar Tramiel from releasing his new computer. One of Tramiel's first acts after forming Atari Corp. was to fire most of Atari's remaining staff, and to cancel almost all ongoing projects, in order to review their continued viability. In late July/early August, Tramiel representatives discovered the original Amiga contract from the previous fall. Seeing a chance to gain some leverage, Tramiel immediately used the contract to counter-sue Commodore through its new subsidiary, Amiga, on August 13. The Amiga crew, still suffering serious financial problems, had sought more monetary support from investors that entire spring. At around the same time that Tramiel was in negotiations with Atari, Amiga entered into discussions with Commodore. The discussions ultimately led to Commodore's intentions to purchase Amiga outright, which would (from Commodore's viewpoint) cancel any outstanding contracts - including Atari Inc.'s. This "interpretation" is what Tramiel used to counter-sue, and sought damages and an injunction to bar Amiga (and effectively Commodore) from producing any resembling technology. This was an attempt to render Commodore's new acquisition (and the source for its next generation of computers) useless. The resulting court case lasted for several years, with both companies releasing their respective products. In the end, the Amiga computer outlasted the Atari. Throughout the life of the ST and Amiga platforms, a ferocious Atari-Commodore rivalry raged. While this rivalry was in many ways a holdover from the days when the Commodore 64 had first challenged the Atari 800 (among others) in a series of scathing television commercials, the events leading to the launch of the ST and Amiga only served to further alienate fans of each computer, who fought vitriolic holy wars on the question of which platform was superior. This was reflected in sales numbers for the two platforms until the release of the Amiga 500 in 1987 which led the Amiga sales to exceed the ST by about 1.5 to 1, despite reaching the market later. However, the battle was in vain, as neither platform captured a significant share of the world computer market and only the Apple Macintosh would survive the industry-wide shift to Microsoft Windows running on PC clones. Adam Osborne stated in April 1981 that "the microcomputer industry abounds with horror stories describing the way Commodore treats its dealers and its customers." Many in the industry believed rumors in late 1983 that Commodore would discontinue the 64 despite its great success because they disliked the company's business practices, including poor treatment of dealers and introducing new computers incompatible with existing ones. One dealer said "It's too unsettling to be one of their dealers and not know where you stand with them." After Tramiel's departure, another journalist wrote that he "had never been able to establish very good relations with computer dealers ... computer retailers have accused Commodore of treating them as harshly as if they were suppliers or competitors, and as a result, many have become disenchanted with Commodore and dropped the product line". However, upon the 1987 introduction of the Amiga 2000, Commodore retreated from its earlier strategy of selling its computers to discount outlets and toy stores, and now favored authorized dealers. Software developers also disliked the company, with one stating that "Dealing with Commodore was like dealing with Attila the Hun." At the 1987 Comdex, an informal InfoWorld survey found that none of the developers present planned to write for Commodore platforms. Although Comdex was oriented toward business computing, not Commodore's traditional consumer market, such a response did not bode well for Commodore's efforts to establish the Amiga as a business platform. Commodore faced the problem, when marketing the Amiga, of still being seen as the company that made cheap, disposable computers like the 64 and VIC were perceived to be. By the late 1980s, the personal computer market had become dominated by the IBM PC and Apple Macintosh platforms and Commodore's marketing efforts for the Amiga were less successful in breaking the new computer into this now-established market than its promotions for the 8-bit line had been in making Commodore the home computer leader. The company put effort into developing and promoting consumer products that would not be in demand for years, such as an Amiga 500-based HTPC called CDTV. As early as 1986, the mainstream press was predicting Commodore's demise, and in 1990 Computer Gaming World wrote of its "abysmal record of customer and technical support in the past". Nevertheless, as profits and the stock price began to slide, The Philadelphia Inquirer's Top 100 Businesses annual continued to list several Commodore executives among the highest-paid in the region and the paper documented the company's questionable hiring practices and large bonuses paid to executives amid shareholder discontent. Commodore failed to update the Amiga to keep pace as the PC platform advanced. CBM continued selling Amiga 2000s with 7.14 MHz 68000 CPUs, even though the Amiga 3000 with 25 MHz 68030 was on the market. Apple by this time was using the 68040 and had relegated the 68000 to its lowest end model, the black and white Macintosh Classic. The 68000 was used in the Sega Genesis, one of the leading game consoles of the era, which surpassed the Amiga's gaming capabilities. PCs fitted with high-color VGA graphics cards and SoundBlaster (or compatible) sound cards had finally caught up with the Amiga's performance and Commodore began to fade from the consumer market. Although the Amiga was originally conceived as a gaming machine, Commodore had always emphasized the Amiga's potential for professional applications. But the Amiga's high-performance sound and graphics were irrelevant for most of the day's MS-DOS-based routine business word-processing and data-processing requirements, and the machine could not successfully compete with PCs in a business market that was rapidly undergoing commoditization. Commodore introduced a range of PC compatible systems designed by its German division, and while the Commodore name was better known in the US than some of its competition, the systems' price and specs were only average. In 1989, the A600 replaced the A500. It removed the numeric keypad, Zorro expansion slot, and other functionality, but added IDE, PCMCIA and a theoretically cost-reduced design. Designed as the Amiga 300, a nonexpandable model to sell for less than the Amiga 500, the 600 was forced to become a replacement for the 500 due to the unexpected higher cost of manufacture. Productivity developers increasingly moved to PC and Macintosh, while the console wars took over the gaming market. 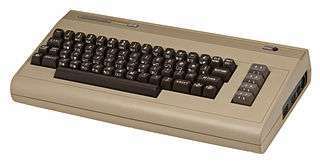 David Pleasance, managing director of Commodore UK, described the A600 as a 'complete and utter screw-up'. In 1992, Commodore released the Amiga CD32 and the Amiga 1200, and in 1992 Amiga 4000 computers, which featured an improved graphics chipset, the AGA. The custom-designed and custom-built AGA chipset cost Commodore more than the commodity chips used in IBM PCs, despite lagging them in performance. The advent of PC games using 3D graphics such as Doom and Wolfenstein 3D spelt the end of Amiga as a gaming platform, due to mismanagement. In 1993, the 'make or break' system, according to Pleasance, was a 32-bit CD-ROM-based game console called the Amiga CD32, but it was not sufficiently profitable to put Commodore back in the black. In the 1992, all UK servicing and warranty repairs were outsourced to Wang Laboratories., who were replaced by ICL after failing to meet repair demand during the Christmas rush 1992. By 1994, only its operations in Germany and the United Kingdom were still profitable. Commodore declared bankruptcy on April 29, 1994 and ceased to exist, causing the board of directors to "authorize the transfer of its assets to trustees for the benefit of its creditors", according to an official statement. The company's computer systems, especially the C64 and Amiga series, retained a cult following decades after its demise. Following its liquidation, Commodore's former assets went their separate ways, with none of the descendant companies repeating Commodore's early success. Both Commodore and Amiga product lines were produced in the 21st century, but separately with Amiga, Inc. being its own company and Commodore computers being produced by Commodore USA, an unrelated Florida-based company that had purchased the brand name. Other companies develop operating systems and manufacture computers for both Commodore and Amiga brands as well as software. “ "Commodore's high point was the Amiga 1000 (1985). The Amiga was so far ahead of its time that almost nobody--including Commodore's marketing department--could fully articulate what it was all about. Today, it's obvious the Amiga was the first multimedia computer, but in those days it was derided as a game machine because few people grasped the importance of advanced graphics, sound, and video. Nine years later, vendors are still struggling to make systems that work like 1985 Amigas. Commodore UK was the only subsidiary to survive the bankruptcy and even placed a bid to buy out the rest of the operation, or at least the former parent company. For a time it was considered the front runner in the bid, and numerous reports surfaced during the 1994–1995 time frame that Commodore UK had made the purchase. Commodore UK stayed in business by selling old inventory and making computer speakers and some other types of computer peripherals. However, Commodore UK withdrew its bid at the start of the auction process after several larger companies, including Gateway Computers and Dell Inc., became interested, primarily for Commodore's 47 patents relating to the Amiga. Ultimately, the successful bidder was German PC conglomerate Escom, and Commodore UK went into liquidation on August 30, 1995. In 1995 Escom paid US$14 million for the assets of Commodore International. 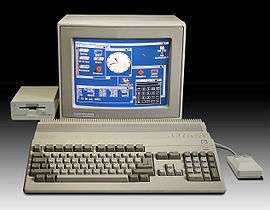 It separated the Commodore and Amiga operations into separate divisions and quickly started using the Commodore brand name on a line of PCs sold in Europe. However, it soon started losing money due to over-expansion, went bankrupt on July 15, 1996, and was liquidated. In September 1997, the Commodore brand name was acquired by Dutch computer maker Tulip Computers NV. In July 2004, Tulip announced a new series of products using the Commodore name: fPET, a flash memory-based USB Flash drive; mPET, a flash-based MP3 Player and digital recorder; eVIC, a 20 GB music player. Also, it licensed the Commodore trademark and "chicken lips" logo to the producers of the C64 DTV. In late 2004, Tulip sold the Commodore trademarks to Yeahronimo Media Ventures for €22 million. The sale was completed in March 2005 after months of negotiations. Yeahronimo Media Ventures soon renamed itself to Commodore International Corporation and started an operation intended to relaunch the Commodore brand. The company launched its Gravel line of products: personal multimedia players equipped with Wi-Fi, with the hope the Commodore brand would help them take off. The Gravel was never a success and was discontinued. On June 24, 2009, CIC renamed itself to Reunite Investments. CIC's founder, Ben van Wijhe, bought a Hong Kong-based company called Asiarim,. The brand is now owned by C= Holdings (formerly Commodore International B.V.): Reunite became the sole owner of it in 2010, after buying the remaining shares from the bankrupt Nedfield, then sold it to Commodore Licensing BV, a subsidiary of Asiarim, later in 2010. It was sold again on 7 November 2011: this transaction became the basis of a legal dispute between Asiarim (which, even after that date, made commercial use of the Commodore trademark, among others by advertising for sale Commodore-branded computers, and dealing licensing agreements for the trademarks) and the new owners, that was resolved by the United States District Court for the Southern District of New York on 16 December 2013 in favour of the new owners. The Commodore Semiconductor Group (formerly MOS Technology, Inc.) was bought by its former management and in 1995, resumed operations under the name GMT Microelectronics, utilizing a troubled facility in Norristown, Pennsylvania that Commodore had closed in 1992. By 1999 it had $21 million in revenues and 183 employees. However, in 2001 the United States Environmental Protection Agency shut the plant down. GMT ceased operations and was liquidated. Ownership of the remaining assets of Commodore International, including the copyrights and patents, and the Amiga trademarks, passed from Escom to U.S. PC clone maker Gateway 2000 in 1997, who retained the patents and sold the copyrights and trademarks, together with a license to use the patents, to Amiga, Inc., a Washington company founded, among others, by former Gateway subcontractors Bill McEwen and Fleecy Moss in 2000. On March 15, 2004, Amiga, Inc. announced that on April 23, 2003 it had transferred its rights over past and future versions of the Amiga OS (but not yet over other intellectual property) to Itec, LLC, later acquired by KMOS, Inc., a Delaware company. Shortly afterwards, on the basis of some loans and security agreements between Amiga, Inc. and Itec, LLC, the remaining intellectual property assets were also transferred from Amiga, Inc. to KMOS, Inc. On March 16, 2005, KMOS, Inc. announced that it had completed all registrations with the State of Delaware to change its corporate name to Amiga, Inc. The Commodore/Amiga copyrights were later sold to Cloanto. AmigaOS (as well as spin-offs MorphOS and AROS) is still maintained and updated. Several companies produce related hardware and software today. This product line consists of original Commodore products. Commodore's own software had a poor reputation; InfoWorld in 1984, for example, stated that "so far, the normal standard for Commodore software is mediocrity". Third parties developed the vast majority of software for Commodore computers. KERNAL- Core OS routines for the 8-bit range; ROM resident. ↑ "Commodore International B.V.: Private Company Information". Investing.businessweek.com. 2008-09-17. Retrieved 2009-08-10. ↑ "Calculator maker integrates downwards". New Scientist. Vol. 71 no. 1017. September 9, 1976. p. 541. ISSN 0262-4079. ↑ Software Development Times (January 1, 2008), Page 10. ↑ Dickerman, Harold (August 1982). "The Commodore 8032 Business System". BYTE. p. 366. Retrieved 16 January 2016. ↑ "RUN Magazine Issue 30 June 1986". ↑ "Computer Commercial: Are You Keeping Up With Your Commodore (1983)(Commodore)(AU).mp4". Internet Archive. Retrieved 29 November 2015. ↑ Mitchell, Peter W. (1983-09-06). "A summer-CES report". Boston Phoenix. p. 4. Retrieved 10 January 2015. 1 2 Mace, Scott (1984-02-27). "Can Atari Bounce Back?". InfoWorld. p. 100. Retrieved 18 January 2015. 1 2 Leeman, Sheldon (May 1984). "The Future of Commodore?". Ahoy!. p. 44. Retrieved 27 June 2014. ↑ Kleinfield, N. R. (1984-12-22). "Trading Up in Computer Gifts". The New York Times. Retrieved 5 February 2015. ↑ Garamszeghy, Mikos (1987). "Commodore in Europe: An International Comparison of Price and Availability" (PDF). The Transactor. Transactor Publishing. 7 (6): 21–23. Retrieved 5 December 2015. ↑ "News BRK" (PDF). The Transactor. Transactor Publishing. 5 (2): 6–14. 1984. Retrieved 1 January 2015. ↑ "News and New Products" (PDF). The Transactor. Canadian Micro Distributors. 4 (2): 4–9. 1983. Retrieved 5 December 2015. ↑ Anderson, John J. (March 1984). "Commodore". Creative Computing. p. 56. Retrieved 6 February 2015. ↑ Maher, Jimmy (2013-07-28). "A Computer for Every Home?". The Digital Antiquarian. Retrieved 10 July 2014. ↑ Herzog, Marty (January 1988). "Neil Harris". Comics Interview (54). Fictioneer Books. pp. 41–51. ↑ "TOP SECRET: Confidential Atari-Amiga Agreement". Atari Historical Society. November 1981. Retrieved 2006-07-23. ↑ ""Confidential Atari-Amiga Agreement" and "Afterthoughts: The Atari 1600XL Rumor"". Archives.atarimuseum.com. Retrieved 2009-08-10. ↑ Wierzbicki, Barbara (1983-12-05). "Longevity of Commodore 64, VIC 20 questioned". InfoWorld. p. 24. Retrieved 13 January 2015. ↑ "Commodore's Back On Line, And Amiga's The Reason". ↑ "The Great Amiga Reboot". ↑ "1987 Commodore ad in InfoWorld targeted at dealers". ↑ Chin, Kathy (1985-01-28). "Atari Promises Software For ST". InfoWorld. IDG. p. 17. Retrieved 2011-03-19. ↑ "OS/2's Arrival Marks the Dawn of a New Era". ↑ Dvorak, John C. (September 1985). "Image". Ahoy!. p. 5. Retrieved 27 June 2014. ↑ "Amiga: 25 Years Later". ↑ "Adios, Amiga?". Time. February 24, 1986. ↑ "The Maturation of Computer Entertainment: Warming The Global Village". Computer Gaming World. 1990-07-08. p. 11. Retrieved 16 November 2013. ↑ "Pay Went Up As Profits Plunged Proxy Reveals Big Salaries At Commodore". ↑ "Executive Benefits Questioned Commodore Hurting, But Officials Aren't". Ali's minimum $2 million annual combined salary and bonus will certainly earn him a place among the most richly rewarded technology company executives in the country. ↑ "The Amiga Story: Conceived at Atari, Born at Commodore". Commodore began to falter in the early 90s as Windows PCs became more advanced. The multimedia features that wowed audiences in 1985 were commonplace in even inexpensive computers of the early 90s. ↑ "What's hot: Amiga or Sega?". Still, Amiga owners could take consolation in the fact that their system played the best games around. But that's no longer the case. Three new videogame systems--the Sega Genesis, NEC TurboGrafix, and SNK's NeoGeo--have surpassed the Amiga as a game machine. Another up-and-comer, the Nintendo SFX (known in Japan as the SuperFamicom), will blow it away. Meanwhile, after seven years the Amiga still has the same palette, the same eight sprites, and the same four audio voices. ↑ "Taking the PC Plunge!". ↑ "A history of the Amiga Part 8: The demo scene". ↑ "MULTIMEDIA AND TELECOMMUNICATIONS, 1997-2002:PERSPECTIVES AND RECOMMENDATIONS.". ↑ "Looks great, Manny, but will it sell?". ↑ "PERIPHERALS; COMMODORE INTRODUCES NEW AMIGA". ...as a new, untested machine from a company that has previously sold its products in toy stores, Amiga faces a tough challenge in cracking the conservative business market. Commodore officials vow that Amiga is the flagship of an armada of business products that will transform the company into a major international force in technology. ↑ "RUN Magazine issue 42". ↑ Tim Smith and Chris Lloyd (1994), "Chewing the Facts", 'Amiga Format' Annual 1994, 106-111, 107. ↑ "The Future Was Here: The Commodore Amiga". ↑ "Natami Project Home Page". ↑ "Amiga Shopper Feb 1995". ↑ "Commodore Sinks". GamePro (60). IDG. July 1994. p. 168. ↑ "Kidnapper's retro computer offers scant clues". The beige-coloured machine was popular in the 1980s but is now considered an antique, though some electronic dance acts still use it and it has a cult following among some fans of retro computers. ↑ "Ced Kurtz's Techman Texts: Andy's Amiga a cult computer favorite". ↑ "Commodore Auction Report". Retrieved 29 November 2015. ↑ "Tulip offloads Commodore brand". Retrieved 29 November 2015. ↑ "Commodore International Corporation Changed Its Company Name to Reunite Investments, Inc.". Reuters. June 24, 2009. ↑ "EDGAR Filing Documents for 0001457860-09-000002". Sec.gov. Retrieved November 29, 2012. 1 2 Faillissements verslag Commodore Licensing B.V.
↑ "Cloanto confirms transfers of Commodore/Amiga copyrights". amiga-news.de. Retrieved 2015-02-20. ↑ Mace, Scott (1984-04-09). "Atarisoft vs. Commodore". InfoWorld. p. 50. Retrieved 4 February 2015. Wikimedia Commons has media related to Commodore International.